Our collection at TitaniumStyle.com is not just known for rings and wedding bands but bracelets and titanium necklaces too. Our carefully designed necklaces carry the same features as our rings; they too are hypoallergenic, affordable, durable, and lightweight. 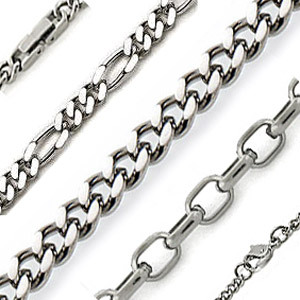 Our special designs include the Figaro chain, cable chain, and ball chain. Titanium necklaces from TitaniumStyle.com comes out polished. We also offer a brushed finish for our customers who prefer a Satin finish on their Titanium jewelry, although this would have to be requested upon order. Polished: this type of finish is also known as a mirror finish or high polish. The most common finish on jewelry, polish-finished jewelry comes out as shiny and reflective. Your reflection should be visible on the ring and it makes for a very noticeable piece of jewelry. Scratches are almost always shiny, so a polished finish tends to hide them. Hand-finished jewelry ensures the preservation of the stones or gems on it. Brush finished: Brush finished, also known as Satin finish, comes out as matte. The jewelry is not shiny and reflective thus giving it a smoother, more subtle look, though it tends to show shiny scratches more. 3M Scotch-bright pads (maroon color) can be used to touch up the finish and eliminate small scratches and are available in the paint department in most hardware stores, or TitaniumStyle.com can supply one. The commitment we give to our customers doesn’t just end with their order and purchase of Titanium jewelry. We offer a refinishing policy which is free (with the exception of shipping charges) to all those who purchase our items. Should you find any scratches on your titanium ring, bracelets, or titanium necklaces upon delivery, you can send it back to us to have it refinished. Learn more about our Lifetime Refinishing Policy. The countless designs we offer at TitaniumStyle.com is sure to tickle the fancy of every man and woman, regardless of whether they have a different kind of fashion sense, love for Titanium metal, or simply jewelry collectors. 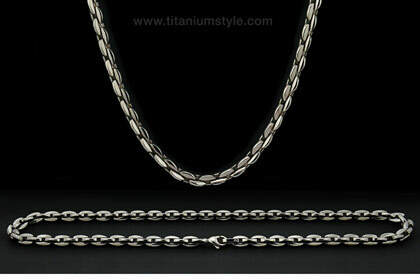 Our titanium necklaces come in different lengths and designs to accommodate the simplest up to the most extravagant. We have three bestselling designs for our titanium necklaces. If you’d like to bring out the inner U.S. Marine in you, we recommend our Titanium ball necklaces. They are likened to the chains used in military dog tags, which are simple and easy to match with casual wear. It is lightweight, durable, and comfortable even for everyday wear. Our Titanium cable chain necklaces have that classic oval link cable chain design that comes with a lobster clasp which could be worn to add a little androgyny or muscle to every outfit. This is also available for women who would like to create an edgy fashion statement or a clean and classic office look for every season. Our Figaro necklace comes with a fold over clasp or can be ordered without a clasp to give it the appearance of a continuous loop. Designed to comfortably go over the head, the design it has creates a more elegant and bold vibe for both men and women. Giving your outfit that pop of jewelry or statement it needs. Browse through our online collection to help you find the right piece of Titanium jewelry for you!